Lemley’s styles range from traditional to distorted realism, especially with the line or blind-contour pieces, which is when the artist looks only at the object and not at the drawing. The final pieces are floating figures of distinct realistic features mixed with unexpected bends and twists. Her favorite subject is the human figure but she is also attached to things like water lilies, wildflowers and wildlife. 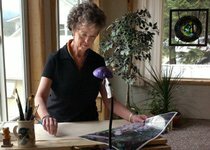 She is a member of the Spokane Watercolor Society and an Art Education Committee member at the Northwest Museum of Arts and Culture.